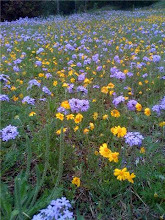 In honor of the blooming herbs here in the Hill Country garden I dedicate this post to the topical uses of Borage, Yarrow, Vitex, Calendula, Rose, Prickly Pear Cactus, and Mullein. Below, I'll share just a little about how easy it is to incorporate these easy to grow herbs in your garden and in your skin care regime. I think each herb could fill a book on its own; however, this entry will simply highlight a few topical uses. I started Borage from seed in early spring. 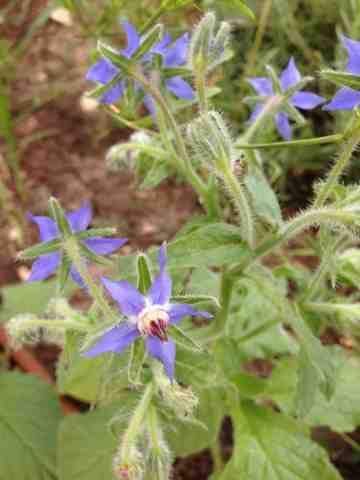 Borage is a good companion plant for tomatoes, so I have some planted along side them as well as in my test "deer resistant" garden. So far, the deer are leaving it alone so we shall see how they continue to do over the months to come. Although, you can eat young leaves and flowers...it is the seed oil that is highly regarded for having anti- inflammatory properties due to the fatty acid gamma-linolenic acid; making this oil a good source of essential fatty acids. It is good for inflamed skin and it's very nice when infused in oil and made into crèmes or salves. The infused oil can be used on its own. Adding a bit of Vitamin E will allow the infused oil to have a longer shelf life. Fatty acids are wonderful for aging, dry, or irritated skin. Yarrow, also known as soldier's wound wort, is a wonderful first aid herb and is very helpful for the skin. Packing Yarrow on bleeding wounds helps subside the bleeding until advanced first aid and care can be administered. It will help subside the bleeding. Drying the stems, leaves and flowers is also a good way to preserve Yarrow. After it is dried, it can be made into a powder in a grain or coffee grinder. Once powdered, you can store in dark glass jars to keep it from getting damaged by the light. The Yarrow powder can be a first aid powder and applied to bleeding cuts or wounds. Another way of using Yarrow is infusion. When leaves and flowers are infused in water, it draws out the healing properties of the herb. 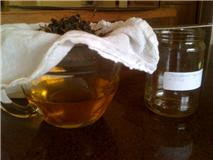 The healing infusion helps serve as a wound wash; cleaning the skin with its astringent and anti microbial properties. This herb is a must have in the garden. It's good to have a first aid herb growing in case you ever need it. Yarrow's salicylic fatty acids are good for adding antibacterial properties to skin care blends (such as cremes and serums) making this a nice addition to blends made for those with acne prone skin. It also has antioxidant properties. That alone is key for good skin care. This herb is very good for oily or inflamed skin and the antibacterial properties helps keep infection at bay. I read a lot about how Vitex, when used internally, balances female hormones; however, I also read here and there that when used topically, it can help with insect bites as well as repel insects from biting you. There's not a lot out there as far as how to use the herb topically, so I was happy to find "Wild Herbs of Crete" (http://quickbooker.org/kunden/wildherbsofcrete_com/pages/portraits-of-our-essential-oils-from-wild-herbs-of-crete/vitex-agnus-castus.php). Here, it explains how Vitex seeds can be made into an essential oil and used to in massage oils as well as used to ward off insect bites. Essential oils come from the fruit/seed extracts and is not overly commercially produced; however, it can be found in select stores and it can be made with a home still. Wild Herbs of Crete explains the benefits of the oil and also discusses benefits in terms of topical massage. Since its known in the US as an herb to take internally, in an effort to balance female hormones, it makes sense that using the oil topically would have nice outcomes. Wild Herbs of Crete indicates massage oil containing Vitex is useful for skin inflamed by hormones, as well as beneficial as a massage oil for breast tissue. I liked reading that it, "reconnects a woman with her inherent harmony within and balances sexual desire between a man and a woman..." When it comes to Vitex, it is all about balance and hormonal harmony. How nice! 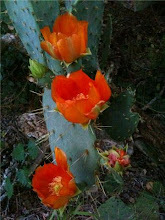 We have it growing in our landscape; it is deer resistant and very beautiful. Calendula is gentle enough for a baby, yet strong enough for all sorts of skin uses. On any given day, I have Calendula petals and flowers solar infusing into oil in the kitchen's most sunny window. I like to solar infuse Calendula into oil for about 4 weeks until the oil is a nice warm yellow/orange color - filled with the Calendula's vitality. Once ready, I strain out the flowers and bottle the infused oil where it waits to be used into massage oil, salves, or crèmes. Calendula promotes cellular turnover, making it a very nice facial crème. It also helps sooth and soften skin. For a quick way to use Calendula, you can heat some water along with a handful of flowers and make an infusion. Once cooled and strained, you can use the infusion as a facial wash, an eye wash, or a first aid rinse. You can also enjoy the steam coming off the infusion for a nice DIY facial steam. A facial steam of this infusion is so wonderful for the face since Calendula boasts anti-inflammatory and anti-viral properties. Calendula is a very nice herb for sensitive or acne prone skin, as well. Calendula helps heal tissue and reduce inflammation. Calendula has so many uses, both internally and topically that it demands an entire book in its honor. In fact, one of my favorite Herbalists and Aromatherapists, Mindy Green, has written a book dedicated to Calendula, simply titled: "Calendula". As she states on the cover of her book, "This soothing first-aid remedy is unsurpassed for skin problems from diaper rash to varicose veins." Now, you can see why it is one of my favorites, as well....since from birth and beyond, this is a beautiful herb to enjoy throughout your lifetime. 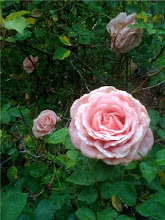 Who doesn't adore rose petals freshly picked from the garden? So delicate, fragrant, soft.....and when kissed by the breeze, takes on the look of butterfly wings dancing in your hand. 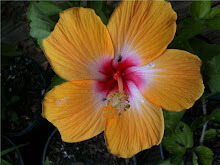 There are so many topical benefits using both the petals and the seed oil. Fresh rose petals can be infused in red wine vinegar (just one of many menstruums, i.e., oil, alcohol, vinegar) to benefit the skin, such as for relieving sunburn or toning the skin. I also like to dry rose petals and finely grind them into a powder to add into honey for a yummy deliciously humectant face mask. This delicious face mask (literally) can be applied to the skin one a month to draw moisture, nourish, protect and heal the skin. Literally: Skin Food! When infused in red wine vinegar, for example, the outcome is a wonderfully vibrant extract that can be diluted with aloe vera juice and rose water to make a cooling facial mist. Imagine this cooling mist on your face after a hot summer day or a hot flash....ahhh..... So nice! Rosehip seed oil is yet another topical treat for your face. Rosehip seed oil is made from the wild roses naturally growing throughout Chili. It has long been a beauty secret for the people of Chili and it's popularity is growing in other countries. Rosehip Seed Oil is very high in essential fatty acids, especially linoleic acid. Rosehip seed oil has been used by women for stretch marks and it has also been used to assist with sun damaged skin and scars. I think this oil is best for dry mature skin, since Rosehip seed oil is very high in essential fatty acids. It seems best for individuals who no longer struggle with bouts of acne or breakouts. I love using this oil on my hands and under my eyes. It is silky and smooth. It absorbs very quickly and does not leave an oily feeling on the skin. Skin is left soft and satin smooth. You can tell you are helping it be the best it can be after using this very special oil. Another one of my favorite skin herbs is Mullein. Mullein is native to Europe, but can be found growing wild in much of our United States. I transplanted this Mullein (pictured) from the back field to our nearby kitchen garden. Mullein transplants very well. A bi-annual, it will soften your heart with time as you and Mullein spend then next 2-3 years enjoying each other's company as changes evolve. Mullein can grow very tall, this Mullein has reached over 6 feet with bloom stalks. It is a very magical plant and just to be around it brings you comfort. Soft leaves and large size suggests how comforting and beneficial it can be to any garden. that I have dedicated to all the gardeners, hard workers and outdoorsy folk I know. Mullein's anti-inflammatory and antibacterial properties make it a household staple for applying after being bit, scratched and "earth touched" while enjoying the great outdoors. Another herb growing in the garden, that I will quickly mention, is Monarda citriodora; purple horsemint. I love to infuse the flowers and leaves in apple cider vinegar and dilute with aloe vera juice and rose hydrosol for a beautiful nourishing astringent toner. It is helpful for acne prone skin and I find it nourishes and tones skin ~ great for summer use when some of us over produce oils in our skin. As you may have guessed, there are entirely too many herbs growing native and naturalized all around us that have topical benefits. I think I could write a book on just this one subject matter. However, I'm so happy to share just a few herbs that I use daily for topical applications. 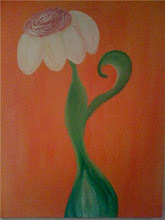 I hope you are enjoying your beautiful day and as always I wish you wonderful green luck! This was a good read! Thanks for sharing this info! I read that you infuse & mix different things and add aloe juice... I have a large jug of plain aloe juice and it says to refrigerate after opening. After you make your toners, do you keep them in the refrigerator? Regarding my toners, after blending essential oil and extracts I find I don't need to refrigerate. I also go through 2oz toners very quickly since I use what I make about twice a day. I live by my favorite saying when it comes to vibrant and fresh handmade botanical blends....use often and generously- your skin will thank you!